Cloudforests experience mist and humidity as a matter of course resulting in biodiversity hotspots – fascinating for tourists and scientists alike. There are four main areas of cloudforest, Monteverde being the most well-known and also the busiest, if you want a more peaceful experience, try Santa Elena, Gerardo de Dota, Bajos del Toro or Los Angeles. Don’t forget to pack a waterproof jacket, suitable footwear and a fleece – it can get chilly in the cloudforest. Monteverde is the most well known of the Costa Rican cloudforests, its variety of biodiversity is second to none. With an almost magical forest feel, Monteverde is often clouded in mist (as you would expect). Despite its popularity it still has a very peaceful atmosphere and is home to hundreds of different birds and mammals. There are plenty of hiking trails, of varying lengths for you to traverse. There is a good selection of accommodation in the area and it’s easy to make this your base from which to explore the area for a couple of days. Located nearby and at a slightly higher elevation than Monteverde is its sister cloudforest, Santa Elena. Less crowded and quieter, you can really immerse yourself in nature and allow the sights and sounds of the forest to take over. Once again, this cloudforest is a haven of lush green vegetation, which provides shelter and food for a variety of birds, insects, mammals and amphibians. Keep your ears open for the howler monkeys, they are sure to make their presence known. Nestled up against the mountains of Talamanca, San Gerardo de Dota is a haven for birders, anglers and nature lovers alike. Still relatively quiet and not on everyones radar this is an excellent place for spending time amongst nature without the crowds. This mountainous area is covered in cloudforest with abundant birdlife. 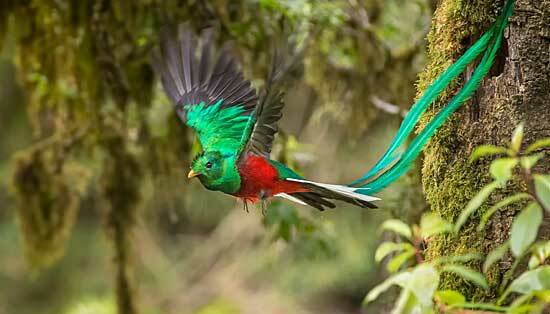 Hummingbirds, trogons and woodpeckers a-plenty, not to mention the dazzling quetzal. Nestled in the shadow of the Poás volcano is Bajos del Toro. There is plenty to do here including fly-fishing, hiking, whitewater rafting, horse riding or simply stand still for a second and absorb the beautiful scenery and forest around you. Once considered off-the-beaten track, this area is now growing in popularity as there is so much to do here in this small reserve, it’s well worth the journey to experience the thick forest with rushing rivers and cascading waterfalls. Shhh, don’t tell everyone but this is one Costa Rica’s best kept secrets. The Los Angeles Cloudforest is a private reserve next to Santa Elena. Those opting to explore this little haven of paradise will do so in almost solitary splendour as most visitors to the area seem opt for the more well known Monteverde Cloudforest. Just shy of 350 species of bird have been recorded here and there are also a host of animals, amphibians and interesting plants to find.